Fossil Walks01297 443370work Guided WalkYour fossil walk ticket gives you FREE access to the museum where you will be able to see displays of rare fossils, learn all about Mary Anning, the famous early palaeontologist who once lived on the site of the museum and much, much more. 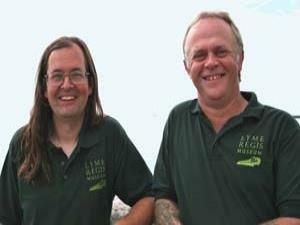 Alternatively, UK residents may send a cheque for the full amount made payable to 'Lyme Regis Museum' to arrive at least 48 hours before the day of the walk. It is, of course, possible to make bookings in person at the Museum. No refunds will be possible for bookings cancelled less than 48 hours before the day of the walk. If, for any reason, the walk has to be cancelled by us then full refunds will be given. Some families return time and again to search with Paddy and Chris among the sand and rocks for fossils that have been washed-down onto the beach after 150 million years. For adults and children alike, it’s an unforgettable experience. Click on Fossil Finds to see some of the fossils found on previous walks. Cost: £11 adults, children and students £6.